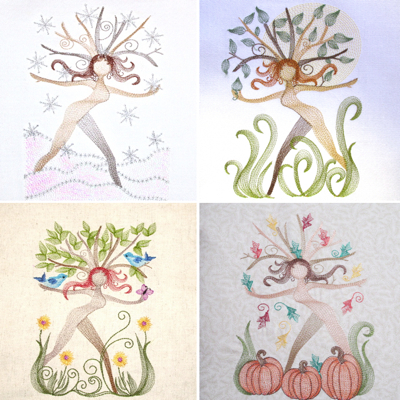 Autumn arrives in artful fantasy with Nature's Fall Nymph! 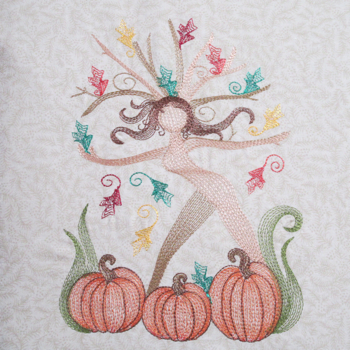 In the earthy & crisp colors of Fall, this sheer contoured nymph stands gracefully branced in her pumpkin patch, amidst baring branches and falling leaves, a perfect picture of Fall! A nature lovers delight for both Fall fashion & home dec accents. Great for everything from tees to totes, jackets & sweatshirts, & pillows to runners & more! Makes a great Halloween alternative design too! Carefully planned color changes allow you the freedom to select colors that perfectly compliment the pallet of your project. Similar side by side color stops allow you to choose to continue with the same thread color (such as for her hair & pumpkin outlining, which elimiates a thread change) or to select colors to suit your fancy! 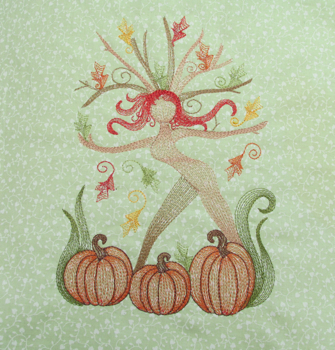 Nature's Fall Nymph is not only a joy to stitch by quick stitching as well! 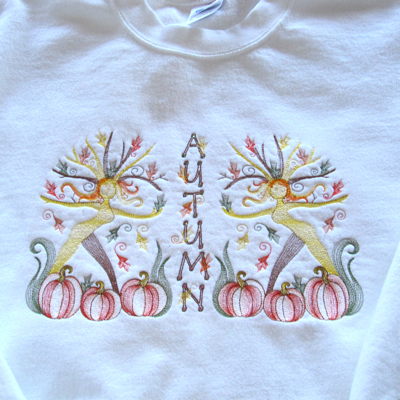 Here's a photo from customer Kris who mirrored Nature's Fall Nymph using variegated thread and added the word Autumn in the center. Great job Kris and thank you for the lovely photo!!! !